I got one of these magnetic calendars from the Container Store! Sticks right on the fridge! It’s right there in front of me all the time! It keeps me straight! Not just with menu plans, but with appts, meetings, and activities, etc! I spend a large amount of time in the kitchen each day and love to have this right there, taking up no counter space and filled with all the information I need to get through each day, week and month! $17 for an extra dose of sanity! 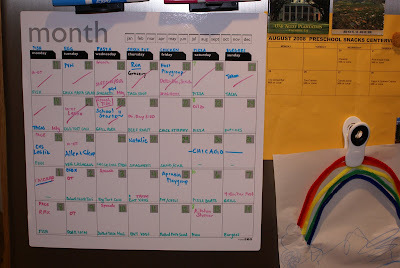 I was just thinking about making a list of all the dinners I make (or can make) and plotting them on a calendar. This way every time I go to make a menu plan I don’t have to reinvent the wheel (or menu plan). This cute calendar would be very handy! I have 8 weeks of dinners printed out and in sleeve protectors. Then I just rotate through them. I love it! I have just found out I am gluten intolerant. . I am a college student and am having a hard time coming up with ideas that are easy and fairly quick. Would you mind sharing your monthly calendar as a guide? Thanks for your help! Im sure you know how overwhelming it is when you first begin a gluten free diet. Great idea! I’m going to have to get one of those! Another idea that I am using is that some places like my mechanic shop and my husbands company storage place gives away free calendars (with their company name) towards the end of the year (like right now.) I am going to use this calendar to write out my menu plan. Michael’s and some other stores also sale calendars for $1.00 and they are not the tiny ones.